As women majoring in computer science and looking to get into game development, we came with the idea of making a game that was light-hearted and approachable, but still very personal to our own struggles. Stress levels are at an all-time high right now for us juniors trying to land internships and that, combined with regular course work and occasional self-doubt can be a lot to overcome. Our solution for now is to make a pretty game about a pretty sprite trapped in a pretty desktop belonging to an incredibly overwhelmed woman in tech. The game drops the player into a level designed to be someone's desktop. 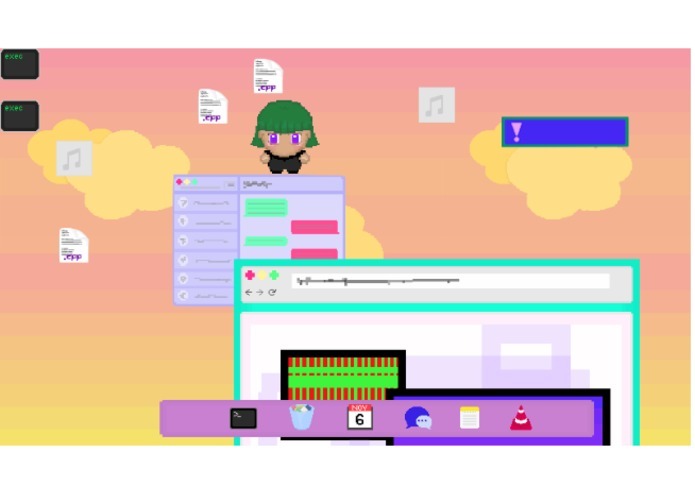 The player can walk and jump around on some icons you'd often see like folders, audio files, and C++ files, as well as a chat window and web browser window. Text and reminder notifications pop up in the corner. The stressful ones like reminders to update your resume or apply for internships become enemies you can't touch, or else! The objective is to stay alive as long as possible despite all the enemies spawning on the screen by keeping an eye out for a positive notification (like a motivational text from a fellow woman in tech). If you get to the positive notification and touch it before it disappears, all the current enemies on the screen disappear, buying you more time. We originally planned for this to be a much bigger game with a clear storyline following the progression of a woman's career. Through little messages and emails we, the players, would see that this was a woman studying computer science and trying to get an internship and she'd get rejected and also face unfair criticism from close-minded people, but ultimately persevere, not only getting her dream internship, but inspiring younger women to go into STEM. This proved to be a bit too much for two people to do in one day so we kept simplifying our idea into the game we have right now. 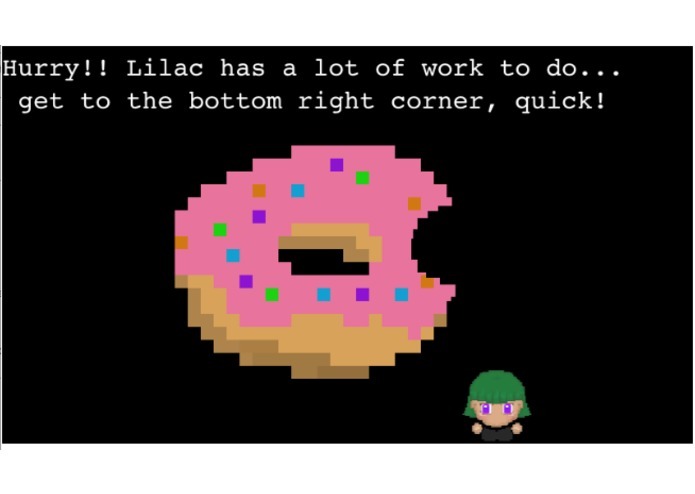 This was the first time we made a game using this method so we're really proud of ourselves for coming out of this event with a project we saw through to the end, especially one that dealt with being women in tech. Another accomplishment would be the visual aspect of the game because we usually forgo aesthetic value to finish on time, but we made the art for the game ourselves and made sure it looked beautiful (in our humble opinions!). We tested the game and can demo it by hosting it on a local server, but we definitely want this to be something we can publicly link and share with people. We also want to have a bigger screen with more space to work with. Level design is a complicated subject so we'd like to study that more and make intelligent decisions about where we place icons to make the experience more consistently fun. Another important component is, of course, movement. We want to make the movement feel smooth for the player and the jumping is currently a weird mix between flying and climbing the sky so ideally, we would like to fix that as soon as possible.